Synopsis The wine yeast Saccharomyces cerevisiae (S. cerevisiae) converts grape sugars into ethanol and also contributes organoleptic properties during wine fermentation. Other non-Saccharomyces yeast species can also impact a wine's sensory profile. S. cerevisiae and other yeast species are increasingly recognized as an important contributor to a wine's regional character, or terroir. We have identified a potentially indigenous population of S. cerevisiae in one Pinot Noir vineyard in British Columbia (BC)'s Okanagan wine region by performing spontaneous fermentation of Pinot Noir grapes and selective plating as a method to enrich for S. cerevisiae species. The Okanagan Valley represents an untapped resource of indigenous wine yeast strains that are of great interest to the BC wine industry. 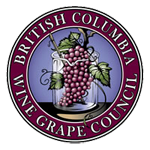 Following our study of one Pinot Noir vineyard, the Measday Lab at the University of British Columbia (UBC) Wine Research Centre (WRC), in collaboration with our industry partner the British Columbia Wine Grape Council (BCWGC), intends to survey S. cerevisiae and other yeast populations in Pinot Noir vineyards of three Okanagan Valley sub-regions. Our objective is to identify indigenous S. cerevisiae populations by spontaneously fermenting Pinot Noir grapes from 13 vineyards in three sub-regions of the Okanagan, explore commercial S. cerevisiae dispersal into the vineyard from wineries, and elucidate differences in Pinot Noir vineyard yeast population structure between the different sub-regions. Our study will be the first to systematically characterize S. cerevisiae populations in different microclimates of a North American wine region and the first to characterize vineyard-associated yeast species across a wine region in Canada. Our long term goal is to discover and characterize a potentially valuable resource of novel indigenous S. cerevisiae strains and other yeasts in Okanagan vineyards that may be used to enhance the region's wine quality and regional character, thereby increasing BC product value and competitiveness in the international wine market. Acetic acid in wine is generally considered to be a spoilage product; acetic acid production can also result in the formation of other unpleasant volatile compounds such as ethyl acetate. By creating a single point mutation in the S. cerevisiae YML081W locus, we can reduce VA in wine by 32%. The production of H2S is a significant problem in the wine industry around the world. The pathways for H2S production have been studied by many laboratories around the world but it has not been fully elucidated. We have now identified a novel gene that regulates H2S production during wine fermentations. By classic breeding we can mutate the S. cerevisiae YDL068W gene which will significantly limit/prevent the formation of H2S in wine. Knowing the yeasts that ferment wine will aid Okanagan wineries in their future yeast-purchasing decisions and will give Okanagan winemakers more confidence in using spontaneous fermentation. Given that a substantial amount of a winery’s capital is spent on commercial yeast, these actions will increase the efficiency by which yeasts are used, resulting in cost reductions. Also, by knowing the yeasts fermenting the wine will lead to intelligent winemaking decisions and general increase in wine quality. There are two types of fermentations: spontaneous and inoculated. In spontaneous fermentation, the must is exposed to the resident yeast population, whereas in inoculated fermentation, a commercially available S. cerevisiae yeast starter is used as an inoculant. The aim of the proposed study is to determine the yeasts present in inoculated and spontaneous fermentations in Pinot Noir and Chardonnay varietals. We will also aim to build our microsatellite database by adding DNA fingerprints of S. cerevisiae strains that were not listed in previously constructed databases. Proposed is the establishment of a small-lot research wine making facility at PARC Summerland, and use of the facility to make wines from viticulture research projects underway. The facility will enable assessment of the wine making quality of fruit produced in response to viticultural research treatments, and relationships among fruit and wine composition and wine sensory characteristics. The facility could also potentially be used to assess wine sensory characteristics that result from site conditions (terroir effects). Establishment of the small-lot facility at PARC will also create a new training opportunity for students. Brett is probably resident in most Okanagan wineries, but is kept in check by current sterile techniques, and the 4-ethylguaiacol and 4-ethylphenol concentrations are very likely well below their thresholds. The concentrations of these two compounds can be used to monitor the effectiveness of Brettanomyces control programs. This analytical method for estimating the extent of Brettanomyces contamination is rapid and will quickly provide information regarding the effectiveness of the sterile techniques. The study of Brettanomyces infection will take into account many variables and will include the following: age of barrel, cooper, block of grapes, variety of grapes, hygiene (hot versus cold water, sterilizing agent), type of oak used in barrels, sulphur dioxide concentration, cellar temperature, and dissolved oxygen. The goal of this proposal is to develop an analytical technique to measure guaiacol and 4-methylguaiacol in grape, which are the compounds responsible for the smoke taint in wines. We have frozen grapes remaining from a previous study. We will then measure these compounds in grapes from Okanagan vineyards that were contaminated by the fire in 2003 and compare these results with grapes harvested in 2001 and 2002 from the same vineyards. We thus hope to develop the ability to quantitatively determine whether wines will have a “smoky” flavour or aroma.